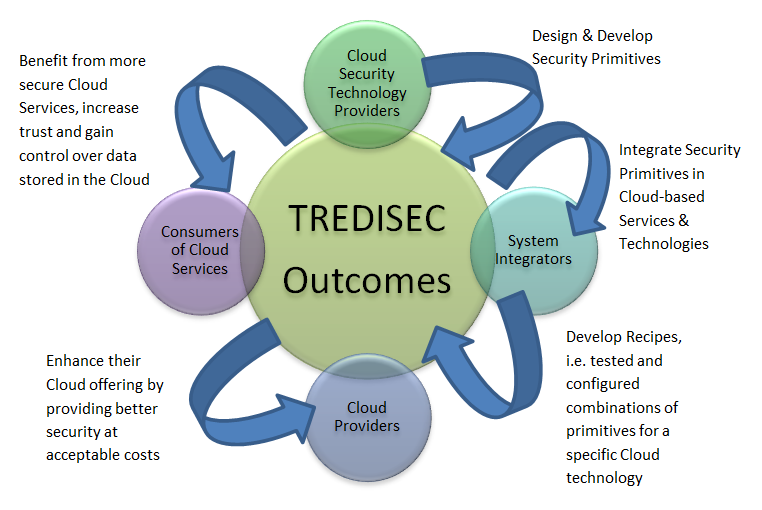 But these are just the visible face of the seven breakthrough innovations in Cloud Security developed in the project. The valuable knowledge shared, the expertise gained and the opportunities created provide an extraordinary feeling of a job well done. Have a quick insight into primitives looking at the dedicated Blog posts series . Get acquainted with our Framework through presentations, videos and the various infographics available at the specific web space. You can even have a first person experience with a demo running framework instance, just follow the link provided and sign up. Additionally, and because the TREDISEC framework is released Open Source under Apache 2.0 license, you can see and even download the code to explore it at your own pace. We would be very happy to hear you make use of it for your own purposes! But we know you, and you do not simply content yourself with seeing the surface. So please, help yourself and deep dive into the details of a high quality research work, described in deliverables and multiple scientific publications accepted at top-ranked conferences such as USENIX Security, IEEE Transactions on Cloud Computing, ACM CCS or ASIACCS . But, wait a minute… Is this really the end? If you are still not satisfied and would like to know about our plans for the future. If you wish to explore any collaboration and continue the work that will take all these results to the next logical step, please contact us!